Police have commended two members of the public for their bravery after they stepped in to help with an arrest. An officer was called to Worthing Hospital on Monday, June 18, following reports of a man acting aggressively towards a member of staff. 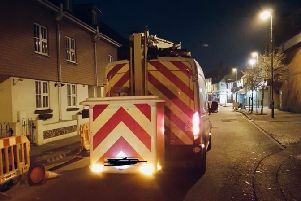 On his way to the hospital the officer drove past 54-year-old Richard Gray, of no fixed address, in nearby Teville Road, Worthing, who matched the description. He went to arrest him for breaching his anti-social behaviour order. Gray resisted the arrest and the two brave members of the public stepped in to help the officer. PC Ian Whitehouse said: “I was on shift by myself and I spotted Gray who matched the description of an earlier incident. “Gray has an anti-social behaviour order in place and the aggressive behaviour at the hospital put him in breach of this order. “I would like to extend my thanks to the two members of public who came to my aid when Gray struggled against the arrest. Gray was charged with assault by beating and two counts of breaching an anti-social behaviour order. Police said he appeared at Crawley Magistrates’ Court on Tuesday, June 19, and pleaded guilty to all three offences. Gray received a six week custodial sentence and a £115 fine, said police.